Fire. The ultimate source of energy. It makes up the sun, which gives us warmth and life. It can transform one element into another. It can help us survive, yet it can also kill. Since the dawn of time when man first discovered fire, to using it for fueling the world today, people cannot help but to be mesmerized by the element of open flame. And so this, is why I’m writing this article. 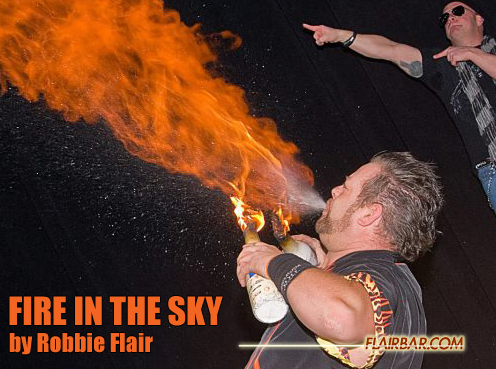 As Flair Bartenders, we are ultimately, entertainers. We focus on using skilled muscle memory in very unique and stylish ways, while working behind the bar. We know that if we entertain our guests and show them a great time, chances are it will reflect in our tip jar. We also contribute to the overall fun and energy in the room, all while enjoying every minute of our job. With that said, one of the most extreme forms of entertaining guests comes from doing Performance Fire Flair (PFF – just made that up, but feel free to use the acryonym). I have been doing PFF for over 17 years now, and I must say, it is the PREFFERRED form of Flair entertainment to the general public . In world Flair competitions, fire is not permitted or the competitor will be disqualified. This is simply because the use of fire is a liability. The risks involved outweigh the entertainment value, so it just isn’t allowed. Many Flair bartenders also feel that PFF is a cop out for true Flair skill. That one doesn’t have to perform much difficulty, because that difficulty is inherent in the open flame itself. I will shed some light on these subjects and hopefully, you will have a better understanding of where I’m coming from. 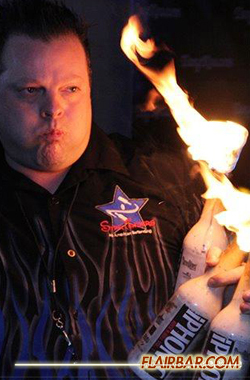 When Flairbar.com asked me to write an article about PFF, Rob Husted explained to me that I am probably one of the most experienced Fire Flair Bartender in the US. I was honored to accept his offer, and hopefully you will get something out of this. I will share with you my story, and what I do to take precaution. You may or may not know…Fire is a living, breathing thing, one you have to drown to get rid of. Or take away it’s food. When you become ONE with this living thing, you will learn to embrace it, rather than fear it. This is when you have mastered PFF. Back in 1996, I was introduced to Flair by Roger Oldham, President of the Professional Bartending Schools of America. 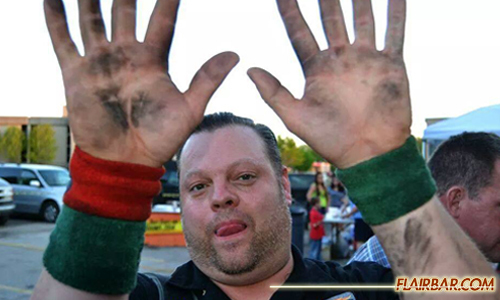 He was a finalist in the 1995 Quest for the Best Bartender in America Contest, put on by Patrick Henry Creative Promotions and Jack Daniels. And, because of this, I was inspired to get involved in Flair and competition. One day, he showed me how to take a few bevnaps, roll them up and use them as a wick in an empty bottle. He dunked the wick into a glass of 151 proof rum, then put the rest of the rum in his mouth, and proceeded to blow a fireball out of his mouth through the napkin wick. I was in awe. How cool was that? I mean he looked like a bartending dragon wearing a bow tie. From that point on, I knew I wanted to Flair, and eventually Flair with fire. The first time I ever tried to throw a bottle that was lit on fire, I was quite nervous. I could hear the fire sucking the oxygen out of the air as it flipped over to my other hand. I wasn’t sure if the bottle would heat up and break, or if I would catch my body on fire with the 151 soaked wick right next to my hand. As time went on, I began to become one with the fire. I wasn’t afraid of it any longer. I started to attempt tricks that were more difficult while they were lit. I would burn my fingers every so often. At first, it was a big deal, but over time, I started to get used to getting a burn every now and then. The same went for blowing or breathing fire. Holding 151 proof alcohol in your mouth for the first time is pretty treacherous. The 75.5% pure ethyl alcohol burns intensely in your mouth, killing the skin surface the longer you hold it in there. In order to produce the largest mushroom clouds of fire, I had to put a good 3-4 ounces of 151 in my mouth. Imagine how that feels. It makes your eyes water and your nose run. However, when you spray it out over an open flame properly, you’ve just produced a visual atomic bomb in the bar. Getting better and better, I was doing exhibition style Flair with bottles on fire. Three and four bottle juggling, body rolls, multiplexes, etc with many catches being around the burning wick. For the sake of the show, I would catch it and release quickly again and that would be some of the times I would receive burns on my hand. However, the fear of fire was gone. Now, being fearless has it’s cons. I recall a bar shift in the Cleveland Flats at a place called The Jungle. I stood atop a platform in the middle of the dance floor, surrounded by hundreds and hundreds of excited partiers waiting to see the show. 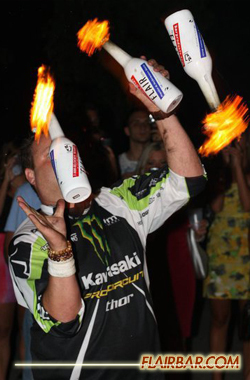 As I was rocking the crowd with the fiery bottles, I was feeling the adrenalin as well. I wanted to give them the ultimate fire ball- a fireball that would hit the 25 foot ceiling with the blast of fiery 151. To avoid spraying all over the crowd, I knew I had to blow the fire ball straight up. Not thinking , I made a very painful mistake. Blowing large, far reaching fireballs requires a lot of 151 in the mouth to be sprayed very finely and slowly . The spray shoots up like a geyser or like water from a whale’s blowhole. What I didn’t consider though , was the initial 151 sprayed, would fall back down through the fire I was still blowing the fireball up. This, is was exactly happened. Within seconds, a shower of re-ignited 151 fell upon my face and head, igniting it entirely. If you’ve ever seen the movie “GhostRider”, then you may be able to get an idea of what I looked like. Having your face and head on fire is a surreal experience. You don’t feel the pain at first, but you hear the sizzle of it burning on your skin and hair. Everything is blurry, kind of like how things look underwater. It happens so fast, and you naturally go into panic mode. My first reaction was to pull my shirt off over my head. In doing so the shirt doused the flames on my head and face and I appeared recovered to the crowd. They were in shock briefly, but once I doused the flames, I pumped my fist as if it were part of the show, and they cheered intensely. I jumped down, ran to the back room, and put cold wet towels on my neck. I had burns on my neck, ears and on the sides of my face. Fortunately because the 151 is a cool burning fuel, they were only light surface burns; painful but not scar worthy. This was a lesson learned in safety precaution. Now, moving forward to the acceptance of Flair among our peers. 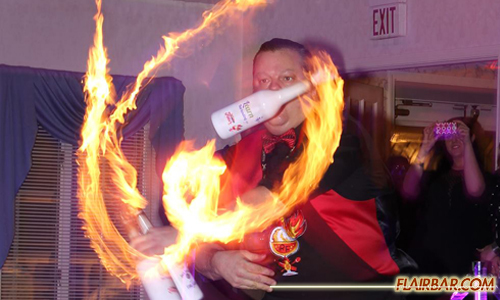 I have heard that many accomplished Flair bartenders aren’t fans of fire Flair because they believe it is a cop out for true Flair skill. Not necessarily. 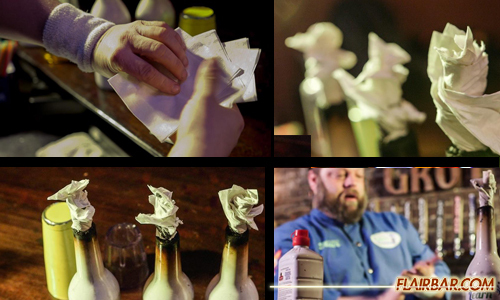 Number one, there are many things you cannot do with fire Flair that you can do with empty glass bottles. Fire burns towards the sky, so you have to hold bottles with the neck up or you’re going to get burned. Number two, attempting a multiplex with two bottles on fire is significantly more difficult than hitting a multiplex with unlit bottles. I like to compare fire Flair to similar stereotypes in the world of Mixology. You are going to have purists wherever you go. We do what we do for our guests. If our guest wants a vodka redbull, and not an Aviation, I will gladly make it for them. Reason being is the bar business is a business. Remember that. The bottom line is all that counts and whatever the guest wants, the guest gets (in most cases). In all my years of Flairing, I do working Flair and exhibition shows. The working Flair doesn’t involve fire at all. The exhibition shows are all fire. Why? It’s what the people want to see. The average person that is spending money isn’t a Legends 10 Judge. They are a party goer that wants to have a good time. Remember that too. You are Flairing for them, so give them what they desire to see. I routinely do fire shows, standing above an intensely loud screaming crowd, while rocking their world. And they always come back to see more! Now, if you’re going to do any type of PFF, the first thing I will say is that you must understand how explosive fire can be. 151 has a high flash point, meaning it ignites rapidly. If you’re going to ever perform with fire, make sure you do it in a large open, ventilated space, that you have a fire extinguisher on hand, and a wet towel to smother yourself with in case you need it. I use white bevnaps as my wicks. The reason for this is because I can fan multiple napkins out on top of one another and when I roll them up into a wick, I can pull the layers of napkin down and out like a flower petal. This opens up the wick for oxygen to flow through and allows the flame to burn larger and more intensely. I also dip the wicks (once tightly twisted into the bottle opening about half way down the wicks length) into odorless charcoal lighter fluid. Lighter fluid burns much hotter and the wicks will stay lit longer and brighter from it. I flip bottles too fast for the wicks to stay lit with 151. 151 produces a dull, blue flame., whereas lighter fluid produces a super bright, yellow intense flame. For Fire Breathing or Blowing, ALWAYS use 151 rum. Never use lighter fluid, as it can come back on you and burn you very badly. Some performers have been known to use paraffin oil. This can be fatal if injested, so I just won’t even go there. When you are about to blow a fireball, make sure you put ALL OF THE 151 in your mouth at once. Do not, I repeat DO NOT try to do multiple sprays from the same 151 you put into your mouth. This is how you catch your face on fire. I have seen this happen many times with beginners. Put the 3-4 ounces in your mouth, hold the fire 6 inches from your face, and blow everything in one large spray, slowly over the open flame. To get a breath for the blowshot, make sure to turn your head away from the fire, and breathe in through your nose. Exhale with your spray slowly and you will have an amazing fireball. Also, make sure you spray as close as possible to the flame. Everything is going away from you, so you don’t have to worry about catching on fire. If you do small sprays consecutively, you run a risk of catching your face on fire, so please, don’t do that. Consider the people around you when you are doing any type of fire show. Have your guests stand back from the bar, and when Flairing keep as far from them that you can. If you lose a bottle, no one is going to catch on fire, but you need to take every precaution there is. The other tip is to use Flairco bottles when doing fire. Glass is unnecessary and dangerous and it heats up much faster than plastic Flairco’s. You can use clear Flairco’s or any other kind of hard plastic bottle. Wicks will also hold more snugly in plastic rather than glass. In closing, practice at home, not on the job. Practice getting your fine mist spray in the shower. You can constantly fill your mouth with water and get the spray down. Imagine how your lips looked when you played air guitar. That’s how you want them to be when you spray. Get used to the fire. Become one with it. I always tell people, that if you’re going to play with fire, then expect to get burned. It comes with the territory. So if you’re afraid of a little finger burn here or there, then I wouldn’t start playing. Keep to the safety standards, and most of all, have fun. You will not only be blowing fire…..you’ll be blowing people’s minds. With that said, please enjoy this video from redbicyclemedia.com. In conjunction with this article, I or Flairbar.com, it’s sponsors or agents do not endorse anyone to play with fire unless they have been properly trained and have undergone all safety precautions. This article is meant to share my story, and how I Flair with fire. It is not meant to instruct anyone who reads this, as I take no responsibility in any experiences should one attempt to do PFF (Performance Fire Flair). If one does attempt to do PFF, one will do so at their own risk.